This versatile and revolutionary product allows any design, including original art to be transferred onto almost any surface, with amazing results. Unlike heat set transfers, Lazertran is a waterslide transfer paper and the process is simple. 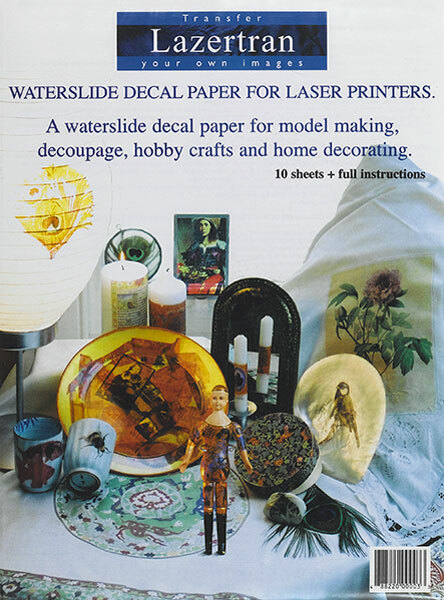 Photocopy or use a laser printer to create color images on Lazertran paper, cut to size, soak in water, and easily slide the transparent decal from the paper backing. Decals can then be applied to wood, paper, stones, glass, metal, candles, walls, clay, and much more! Lazertran Silk transfers images onto silk fabric with an iron rather than decal. The results are vibrant and the silk remains soft to the touch. Each pack includes ten 8½" × 11" (22 cm × 28 cm) sheets. Detailed instructions included.